The reaction children have to puppets ranges from fear and anxiety to total delight. Sans puppeteer, Kermit the Frog is just a floppy felt toy. When someone begins to manipulate him, he’s suddenly a living, breathing, highly engaging amphibian. Go to Frogtown’s performance of “The Grinch,” a loose adaptation of the Dr. Seuss holiday classic, set for 4 p.m. Saturday at The Criterion Theatre in Bar Harbor, and you’ll see just how funny, charming and loveable their puppets can be. The Torbeck siblings are originally from Cumberland, Penn. After Erik graduated from College of the Atlantic, Robin finished up at Colby College, and Brian was done with the Peace Corps, the trio settled down in Bar Harbor in 2000. Frogtown Mountain Puppeteers has its roots in a school project that Erik had. Selling puppets did not prove fruitful — but the Torbecks are an entertaining brood, and they decided that instead of trying to pawn off their little furry friends to customers, they would take the show on the road. One of their first gigs? A monthlong Renaissance fair in their home state of Pennsylvania. While the siblings were building their fan base and making puppets, the three worked odd jobs around the island to make ends meet. Puppetry isn’t easy. The family that plays together stays together, though. While there are occasional bouts of intersibling arguments, by and large, the Torbecks are bound by blood and a shared love of creating and entertaining. Frogtown Mountain has five shows. “Everybody Loves Pirates” is the story of a young girl named Lucy and her goofy friend, Little Chucky, who find a treasure map — and then find a band of bumbling pirates. “The Legend of the Banana Kid” takes Little Chucky into the Wild West, on the back of his trusty steed Goatie. The Halloween show “The Headless Horseman” is an adaptation of Washington Irving’s story, just as the Christmas show “The Grinch” adapts Dr. Seuss. And then there’s “Tales From the Nest,” which is three fractured fairy tales narrated by a family of neurotic birds. When asked which characters are their favorites, the siblings have a hard time picking just one. 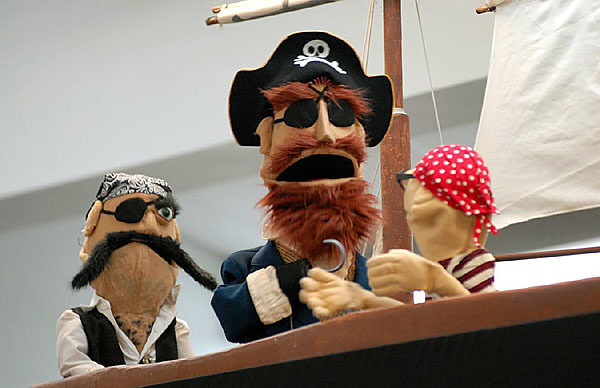 Despite the fact that the siblings are hidden behind a black screen during their performances, puppetry is a very interactive performance style. All three will regularly go out into audiences after shows, to let kids and families meet the puppets. It’s the multidisciplinary elements to puppetry that make it so rewarding for the Torbecks, who are currently working on their first new Frogtown show in four years — an as-yet unnamed musical about dinosaurs. They are also hoping to collaborate with some Maine environmental organizations on a series of videos, featuring the puppets, which educate about the environment and conservation. The only drawback? All that time spent manipulating puppets can take a toll on the arm muscles. But the Torbecks seem to dodge that bullet. 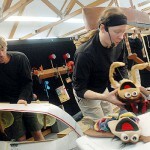 For information on Frogtown Mountain Puppeteers, as well as a full schedule of performances, visit www.frogtownpuppets.com.